The cellular and physiological effects resulting from hypoxia-dependent networks have been clearly shown to impact a number of human pathological states, including ischemic disease, diabetes, pulmonary disease and, perhaps most notably, cancer. Thus, further research into the biomedical effects of hypoxia could lead to novel therapeutic approaches for these diseases. In a previous post, we looked at the role of HIF-1α and HIF-2α in the hypoxia phenomenom. Metabolic reprogramming in cancer cells is closely linked to biochemical and biosynthetic changes induced by hypoxia. Angiogenesis refers to new vessel formation from pre-existing ones. This process is essential during development, wound healing, as well as the transition of malignant tumors. The VEGF family has been identified as a major contributor to angiogenesis, while families of Angiopoietin, PDGF, and FGF govern the process as wel l. The most important member of the VEGF family is VEGF-A, which couples with its receptor VEGFR2 to stimulate signals in endothelial cells for survival, proliferation, adhesion, migration, and tubular formation. This signaling also mediates vessel permeability and stimulates inflammatory response. During hypoxia, HIF-1α and HIF-2 interact with ANG1 & ANG2. Hypoxia inhibits the entry of pyruvate into the TCA cycle and diverts the glycolytic flow to lactate synthesis in cancer cells, a process described as aerobic glycolysis or the Warburg effect. This switch was recently shown to be mediated via PKM2 and JMJD5, which coordinately enhance the HIF1α-mediated transcriptional activation of LDHA . Hypoxia stimulates the expression of additional prometastatic factors, such as uPAR, LOX, PAI-1, and MMP-2. The expression of tumor-promoting cytokine and growth factor by stromal cells (TGF-ß, PDGF, and IL-1ß) is also induced by ionizing radiation. Hypoxia regulates gene expression to alter cell homeostatic functions on normal or cancer cells. Herein we hallmark the key molecules of cell cycle involved in these effects for the development of novel hypothesis in cell cycle control. 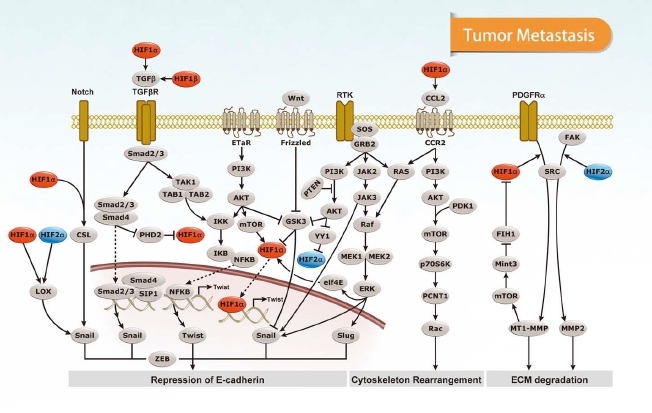 An important component of the hypoxic response is the activation of the hypoxia-inducible factor 1 (HIF-1), along with the synergistic or antagonistic effects of the tumor suppressor protein P53, retinoblastoma protein (Rb), and the interplay between check-point control factors on cell cycle regulation for pro-survival or pro-death state. However, the mechanisms responsible for this state transition remain obscure. It seems to be different according to the cell types and depends on the severity of the hypoxic condition. Research on this topic will certainly contribute to improving the understanding of hypoxia-regulated cell cycle control in various diseases, particularly in cancers. Take a look at this Poster on Hypoxia Regulation to explore a little further. 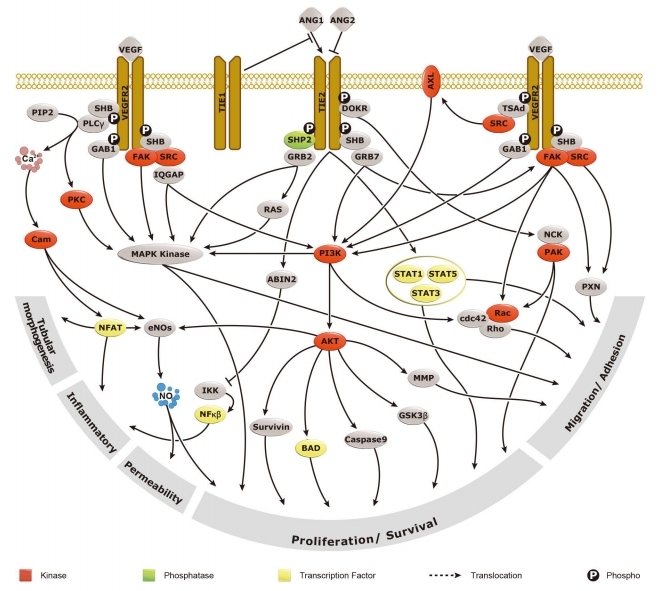 Or if you’re looking for a specific intracellular pathway, don’t hesitate to leave your questions below!